Angulation in rear should be between slight to moderate to complement the forequarters, creating balance and typical gait. Hindquarters are well muscled with hocks perpendicular to the ground. Feet - The feet should be compact, well rounded, cat-like. Toes are nicely arched, with black nails. Head - The muzzle should be dark in color. "Spectacles" and shadings, as previously described, are characteristic of the breed and must be present to some degree. Ears should be very darkalmost black. Legs and Feet - Legs and feet are cream. Faults - Pronounced white markings. Black markings more than halfway down the foreleg, penciling excepted. White foot or feet. Very Serious Faults - Entirely black or white or any solid color; any pronounced deviation from the color as described. 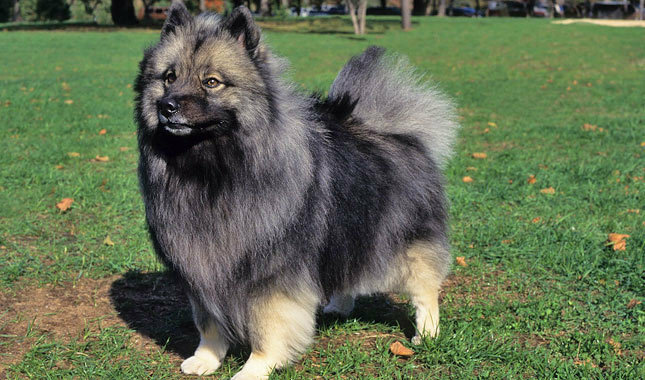 Click Here to Learn about breeder background checks on Keeshond breeders if you are looking for Keeshond puppies for sale. Click Here to learn how ResearchBreeder.com can help you find healthy Keeshond puppies for sale. Click Here to order a Breeder or Kennel Background Check on Keeshond Breeders that may have Keeshond puppies for sale. Click here to find the national breed club for Keeshond puppies for sale. Click Here to purchase a list of approved ResearchBreeder.com Keeshond Breeders who have Keeshond puppies for sale.